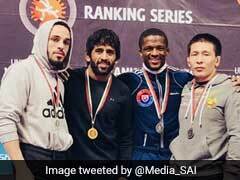 India's Bajrang Punia on Saturday beat Korea's Lee Seung Chul 6-2 to win gold medal in men's 65 kg freestyle category of Asian Wrestling Championships. Bajrang staged a superb comeback after conceding the lead to dominate the second and final round and script a comprehensive win. Punia and Sarita had entered the gold medal rounds of their respective weight categories after posting impressive victories on the penultimate day on Friday. But Sarita failed to grab the opportunity and settled for silver. She lost 0-6 to Aisuluu Tynybekova of Kyrgyzstan in women's 58kg freestyle final. After registering a fabulous 6-2 win, Bajrang celebrated by taking a victory lap with the tri-colour on his shoulders. In his gold medal bout, the 23-year-old Indian conceded two points in the opening half to lag behind 0-2 at the break. However, Bajrang made a strong comeback in the second half as he did not allow his rival from Korea to earn any more points. He first pushed his opponent out of the mat to take one point and then took the Korean down for two more to lead 3-2. From there on, Bajrang displayed an attacking game and never let his rival come back into the contest. He subsequently added three more points to his credit to wrap up the bout in style. London Olympics medallist wrestler Yogeshwar Dutt was present at the gallery to witness his prodigy win the gold medal. "I asked him (Bajrang) to attack all the time and not be defensive and that paid dividends. Winning a gold medal in the Asian Championships is a really big thing," Dutt said. Bajrang earlier made the final of his weight division with a hard-fought 3-2 victory over Kukgwang Kim in the semifinal round. Putting up a brilliant show on his way to the gold medal round, Bajrang got the better of last edition's Asian Championship gold-medallist Meisam Nassiri of Iran 7-5 in the quarterfinal after beating Uzbek wrestler Sirojiddin Hasanov 4-3 in the qualification round. However, gold medal eluded Indian women wrestlers even as this was their best ever performance at the Asian Championship with six medals, including four silver and two bronze. In the 2003 edition, India had won a total of five medals that included two silver and three bronze. Sarita lost 0-6 to Aisuluu Tynybekova of Kyrgyzstan in the final of women's 58kg to settle for a silver. Having climbed down two kilograms to 58kg from 60kg after Sakshi Malik and she interchanged their respective weight categories, Sarita came up with a fine performance before going down tamely in her gold medal bout. "Coming down two kilograms is not a big deal. It is natural for us to jump up and down 2-3 kilograms and right now my original weight is 58kg, so I was comfortable fighting in this category. I want to continue the good show and prepare to qualify for the World Championship in August," said Sarita. She failed to put up a fight and was completely outplayed by the Kyrgyzstan wrestler. Sarita was lagging behind from the very beginning as her rival clinched two points twice in the first half by taking her down to lead 4-0 at the break. In the second half also, the wrestler from Kyrgyzstan continued to dominate and earned two more points to seal the match in her favour. Sarita's journey to the final was a cake walk as she thrashed Uzbekistan's Asem Seydametova10-0 in the quarters before defeating Thi Huong Dao of Vietnam 12-0 to make the gold medal bout. In men's 97kg category, Satywart Kadian, Sakshi Malik's husband, went down in his repechage bout to lose out on a place in the bronze medal play-off. He lost to Batzul Ulziisaikhan of Mongolia 5-8 in a closely-fought contest. In the qualification round, Satywart lost to Magomed Ibragimov 2-2, but since the Uzbek grappler made the gold medal round, the Indian got a chance to fight in repechage. 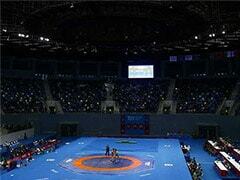 Meanwhile, Olympian Sandeep Tomar suffered a knee injury to bow out of the tournament early in men's 57kg. Tomar was in a winning position when he sustained the injury and that resulted in him losing 5-6 to Ulukbek Zholdoshbekov of Kyrgyzstan. 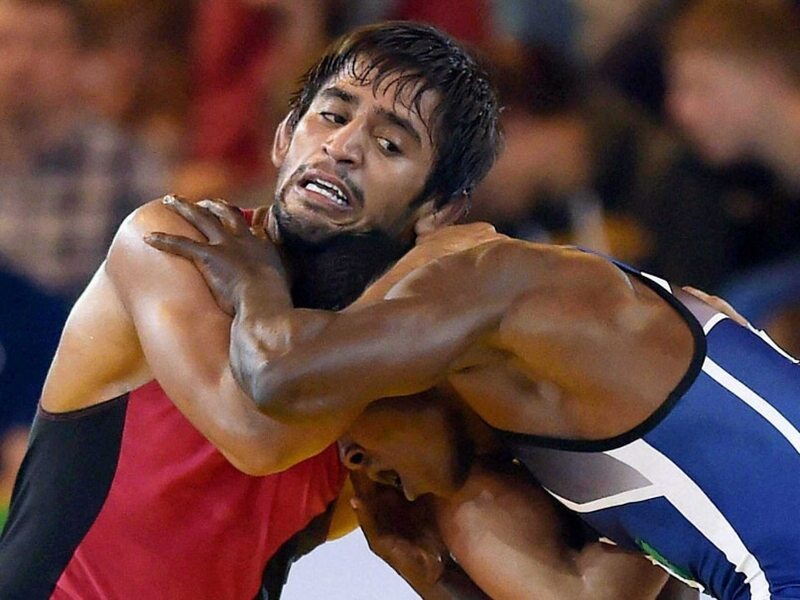 In the men's 74kg, Jitender crashed out of the tournament after losing to Tsubasa Asai of Japan in the quarterfinal round 7-8. Prime Minister Narendra Modi congratulated wrestler Bajrang Punia for winning the gold medal and said the country was proud of his exemplary accomplishment. "Congratulations to Bajrang Punia for securing the Gold in Asian Wrestling Championship. India is very proud of his exemplary accomplishment," he tweeted. Congratulations to Bajrang Punia for securing the Gold in Asian Wrestling Championship. India is very proud of his exemplary accomplishment.